Anyway, it’s interesting to be writing a review of Let Me Sing You Gentle Songs straight after writing about Toni Morrison’s Sula. In one way, it’s not a fair comparison, Morrison is a Nobel Prize winning author with numerous novels and other writing to her credit during her long career, and Olsson has only two three published novels so far (thanks for the clarification, Sharkell!) and (I assume, since she hails from Sweden) she’s writing in English as Another Language. But Sula is an early work, as Olsson’s is, and the contrast between the vivid anger of Morrison’s preoccupations and Olsson’s serenity of tone is quite extraordinary. I think one needs to be in a certain sort of mood for both such books: responsive to an intensely political PoV in the case of Sula, and prepared to suspend belief about the characterisation and actions of the central character; while fans of sincere memoirs of life’s hardships will like Let Me Sing You Gentle Songs; those of us with less sentimental worldviews may be less keen. 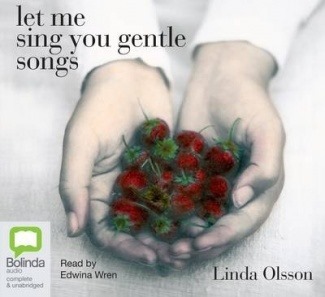 Let Me Sing You Gentle Songs is Linda Olssen’s first book and I am pleased that I read her second before this because I might not have ventured further. I enjoyed The Kindness of Your Nature much more (see my review) but Let Me Sing You Gentle Songs was apparently a best-seller in New Zealand, where Swedish-born Olsson now lives. The rights have been sold around the world. So once again, Lisa at ANZ LitLovers is out of step with popular and critical opinion. Olsson’s writing is beautiful. Her style is spare, elegant and restrained; her plot moves seamlessly between past and present. The novel is set mainly in Sweden where the seasons are so spectacularly marked by an icy barrenness contrasted with the profusion of delicate life in summer. There is also an episode in New Zealand, where the sun always shines, as it does, on lovers. The beach is centre-stage in the New Zealand sections, but the surf is not benign for a stranger unused to its surging power. Olsson captures the way in which her characters feel at home in different places very well. However, the basic premise of the story is an unlikely friendship between an older and a younger woman, neighbours in a remote rural part of Sweden. The older woman, Astrid, is reputed to be a witch because she has isolated herself from the community, but Veronika breaches her defences and they become friends. And over time they develop trust, enough to share confidences about their best-suppressed memories. At the risk of making Veronika’s heartbreak banal, it’s just the loss of the love of her life. But Astrid’s is something else again, an unspeakable act that is never fully explained. And she is at the end of her life, too late to find much solace in unburdening herself although she says she has no regrets that she learned an important lesson in her old age. If made into a movie, I think the concluding scenes of this novel would be a three-hanky film, though I suspect that some in the audience might perhaps be yawning in disbelief. The narration didn’t help. What with the sometimes indecipherable Swedish accents for dialogue and the way the volume rose and fell with the pitch and ebb of emotion, I nearly wore out the volume control on the stereo system in the car. Thanks for another thoughtful review Lisa. I am a sucker for an interesting title and ‘Let me sing you gentle songs’ is temptingly good. Do you think you would have enjoyed it more if you’d read rather than listened to it? Linda Ollson actually has three books, her second was Sonata for Miriam. I really enjoyed Let Me Sing You Gentle Songs. We read it a few years ago as a book club read and I think most of us liked it. I think you captured it perfectly with your description ‘spare, elegant and restrained’. I didn’t really enjoy Sonata for Miriam, about a man struggling with the loss of his daughter – it was fairly bleak. I have The Kindness of Your Nature on my wish list. Ah, thanks for this, I think I must have been confused – you know how sometimes books are published under different names? Let Me Sing You Gentle Songs (which is a lovely title) is published as Astrid and Veronika elsewhere, which is much more ordinary IMO. Yes, I dread the day when my eyesight fails and I’m dependent on them.